October 2011: Villa Galilee Hotel has recently been included in the Chateaux and Hotels Collection, an exclusive group of European hotels and restaurants. The organization was formed in 1975 and now includes 500 hotels and restaurants in France and other parts of Europe. The Villa Galilee is the first hotel in Israel to be included in this group. The Villa Galilee boutique hotel is located on the Canaana Mountain, high above downtown Safed. This hotel, at the top of the highest point in the city, has some of the best views of the Galil. To the west you can see Mount Meron, to the south there is Safed and the Kinneret, and the Golan Heights in the east. This is also one of the few places in the Middle East where you can escape the summer heat. The historic hotel building was originally build 85 years ago by Ben Zion Bruchstein, active in the movement to keep a Jewish presence in the Canaan mountain. The building was originally the Eden Hotel, serving this area during the British Mandate. The hotel fell into disrepair and was abandoned for several years until French olim Rachel and Benny Sivan modernized it and turned it into the current Villa Galilee. This is their “Hotel De Charme” offering unique French style and hospitality. The Villa Galilee completed a massive renovation in December 2010. All the rooms were upgraded. All the baths were replaced. There are new beds that can be separated into twins. The Villa Galilee hotel and everything about it is very European. The design, the decor, the hospitality, is a slice of Europe in the Galil. The kosher hotel restaurant is under the hashgacha of the Safed Rabbanut. The European influence is pronounced throughout the hotel. Walls display reproductions, mementoes and object d'art, including some terrific posters of mid 20th century black & white photographs. There are also decorative porcelain plates, hats on racks, period suitcases, vases with and without flowers, stylized lamps, and more. China closets and glass covered cases in the lobby and on floors display the families collections. There are rugs, flowered curtains and charming tables and objects everywhere you turn, in the rooms and in the lobbies and landings. You will enjoy taking some time to admire the collection. Hotel features: Wireless access throughout the hotel DVD lending library spa dry sauna swimming pool kosher restaurant coffee/sandwich bar elevator indoor and outdoor sitting areas conference room. The hotel's 21 guest rooms are spread out over three floors that can be accessed by elevator. The decorative hotel style continues into the guest rooms, and no two rooms are alike. Each room faces a different direction: the Golan Heights, the Sea of Galilee, and some face Safed. This ensures a unique and singular experience each time you visit Villa Galilee. All Rooms are outfitted with: LCD television with cable and DVD player queen sized bed Robes slippers and complementary toiletries wireless access coffee corner complementary wine. * The Deluxe/Superior, a comfortable middle range rooms have an alcove with a seating area in front of windows that overlook the view. 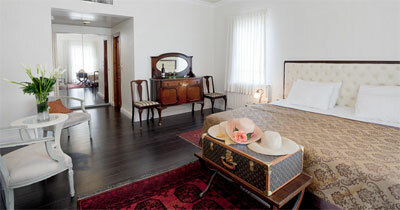 The Deluxe/Superior rooms are available with either a shower or a bath (extra A NIS 40). * Penthouse. Three third floor rooms with large terraces and private hot-tubs. One of the crowning features of Villa Galilee is its restaurant. Meals are served in the beautiful hotel Tzafta Chef’s restaurant, decorated with an eclectic collection of plates, pictures and reproductions of classic French painters. The restaurant is open for lunch and dinner, Sunday – Thursday from 1:00pm - 10:00pm and Friday night dinner with reservations in advance. At dinner, wall lighting gives the restaurant a very pleasant glow, and indeed you will feel like you are in a beautiful European restaurant. Guests at the hotel can enjoy a 3-course dinner for two at the flat rate of a NIS 300. A very fine buffet breakfast is served from 8:30 - 10:00am. The breakfast is rich in salads, cheeses, pastries, coffee and juice and omlettes as you like them. In the style of the hotel, the breakfast buffet is beautifully presented and the dining is elegant on lovely colored tablecloths. This quiet and relaxed atmosphere is a far cry from the noise and the hub-hub in the big hotels. The luxurious Villa Galilee Spa with dry sauna and treatment rooms is located on the pool level of the hotel. The spa was designed with the ultimate in relaxation in mind. The Villa Galilee staff is happy to assist you in reserving and choosing the right treatment. Treatments: Click here for the list of treatments available. If you know the treatment that you want, it is advisable to reserve it in advance of your stay. Contact the spa directly. Cancellations: No penalty will be charged for reservations cancelled up to 4 working days before the date of your visit. Reservations cancelled within 4 working days of your visit will be charged a fee of 50% of the total booking. Cancellations for week end and holiday reservation will be charged 50% up to 7 working days before the booking. The hotel has a separate room that can be used for parties, meetings and conferences. It is fully equipped for presentations with a projector, screen, and wireless access. The room can be set up with a large table or the chairs can be arranged for theater seating. Submitted by: Pamela R., Date: October 2010. Description: We loved the hotel. It is, as you know, very small and very beautifully furnished and we enjoyed every minute we spent there. The breakfast was outstanding and we enjoyed the one evening meal we ate there. We found the staff very helpful, and they could not have done any more for us. The lobby with its beautiful sitting areas was such a relaxing place to sit and chat with our friends. Absolutely wonderful. * Rates quoted are per couple per room in Israeli Shekels including VAT. Prices are for two people in a double room, per night. Mid-week prices are valid Shabbat - Wednesday nights. Week-end rates valid Thursday + Friday nights. Single occupant receives 10% discount on double room rates. Additional person over 12 yrs in the room: 15% discount on rate per person in double room. Cancellation: See the cancellation policy above. Villa Galilee reserves the right to change the terms above.